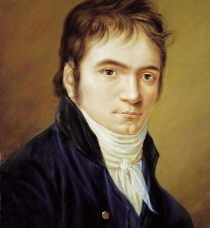 Beethoven’s Kreutzer Sonata was composed in 1803, during the period he was working on the Eroica Sym­phony, and barely six months after his Heiligenstadt Testament. The Kreutzer revitalized the violin sonata: sub­­titled molto concertante, it demanded a new kind of virtu­osity from the violin and piano, and anticipated the more ex­pan­sive emotional land­scape of Beethoven’s mid­dle period. Its first per­for­mance was at the Vienna Augarten with Beethoven him­self at the piano along with a young black violinist, George Bridgetower, for whom the sonata had been written. The story of Bridge­tower, and his collaboration with Beethoven, is told by Rita Dove in Sonata Mullatica. They played Beethoven’s Kreutzer Sonata. Do you know the first presto? Do you?! Ohh! . . . That sonata is a fearful thing. Precisely that part. And music generally is a fearful thing. What is it? I don’t understand. What is music? What does it do? And why does it do what it does? . . . . It, music, at once transports me directly into the inner state of the one who wrote the music. I merge with him in my soul and, together with him, am transported from one state to another, but why I do that I don’t know. The man who wrote, let’s say, the Kreutzer Sonata — Beethoven — knew why he was in such a state. That state led him to certain actions, and therefore that state had meaning for him, while for me it has none. And therefore music only provokes, it doesn’t conclude. Well, they play a military march, soldiers march to it, the music achieves its end; they play a dance tune, I dance, the music achieves its end; they sing a mass, I take communion, the music also achieves its end; while here there’s only provocation, but what’s to follow from that provocation isn’t there. And that’s why music sometimes has such a fearful, such a terrible effect. In China music is a state affair. And that’s how it should be. As if it can be allowed that anyone who likes should hypnotize another or many others and then do what he likes with them. And above all, that this hypnotist should be the first immoral man who comes along. Take, for instance, this Kreutzer Sonata, the first presto. How can that presto be played in a drawing room among ladies in décolleté? It’s played, they applaud a little, and then eat ice cream and talk about the latest scandal. These things can be played only in certain important, significant circumstances, and when there’s a demand to accomplish certain important actions in accordance with that music. Play it and do what the music attunes you to. Otherwise the calling up of an energy, a feeling, that accords neither with the place, nor with the time, that is not manifest in anything, can only have a pernicious effect. On me, at least this thing had a terrible effect; it seemed to me as if completely new feelings, new possibilities, which I hadn’t known until then, were revealed to me. Among his innumerable hasty productions written to order, there are, notwith­standing their artificiality of form, works of true art. But he grows deaf, cannot hear, and begins to write invented, unfinished works, which are consequently often meaningless and musi­cally unintelligible. I know that musicians can imagine sounds vividly enough, and can almost hear what they read, but imaginary sounds can never replace real ones, and every composer must hear his production in order to perfect it. Beethoven, however, could not hear, could not perfect his work, and consequently published productions which are. artistic ravings. Tolstoy also referred to the “shapeless improvisations” of Beethoven’s Opus 101, and said that his Ninth Symphony was “not a good work of art.” Goldenveizer explained this as follows: ”when Tolstoy heard Beethoven he admired him and was captivated by him, but when Tolstoy spoke or wrote about Beethoven he often responded nega­tively con­sidering that Beethoven began the decline of musical art,” and he attributes Tolstoy’s ambivalence toward Beethoven to their “similar temperament.” I suspect that Goldenveizer is on the right track, and that Tolstoy’s struggle to understand Beethoven can also be de­tected in Pozdnyshev’s monologue. 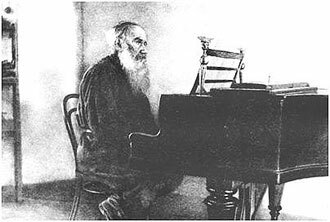 In any case, there is considerable irony in the fact that the greatest novelist of the 19th century, who loved music and was an avid pianist, had such difficulty getting the measure of the century’s greatest composer. The twentieth century has witnessed many Kreutzer’s, the most notable, in my view, being Leoš Janáček’s won­derful String Quartet No. 1 “Kreutzer Sonata”. The Janáček quartet was in­spired by Tolstoy’s novella but also pays musical tribute to Beethoven’s sonata. In a letter Janáček wrote, “I was imagining a poor woman, tormented and run down, just like the one the Russian writer Tolstoy describes in his Kreutzer Sonata.” Other modern versions include a Broadway play (adapted from the Yiddish), a ballet, several novels, a half-dozen movies, and the painting used in the Tabu perfume ads — all, to my knowledge, strongly colored by Tolstoy’s vision.